Marketers are bombarded with data about the growth and importance of mobile. But which type of products are customers buying most (and least) frequently through the mobile channel? And what new challenges do online merchants face with the growth of mobile sales? 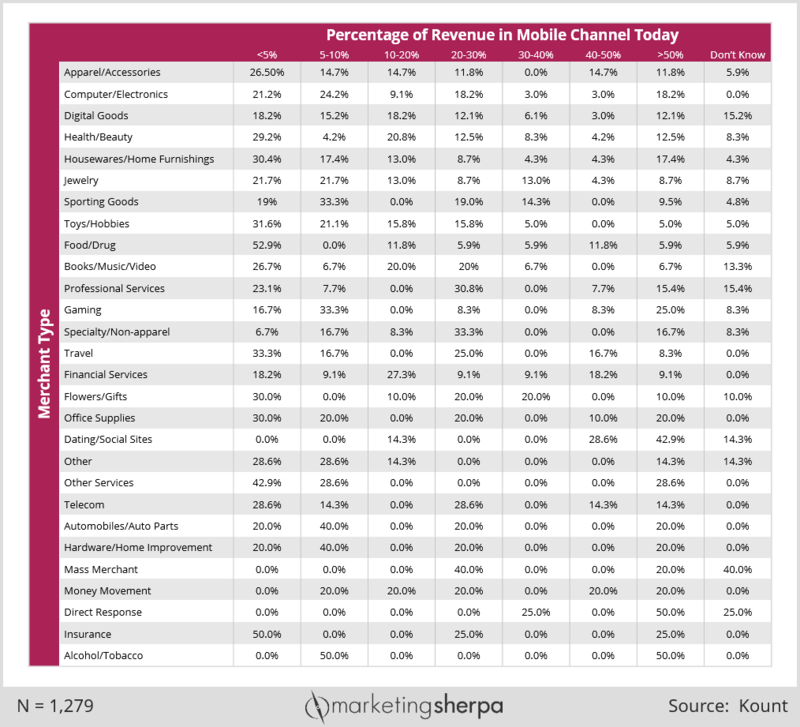 We explore those topics and more in this MarketingSherpa Research Chart. Kount surveyed 1,279 merchants of all sizes to determine, among other discoveries, how much revenue different types of merchants realize from the mobile channel. We interviewed Don Bush, VP of Marketing, Kount, about the data. We discussed the impact on ecommerce business operations from the growth of mobile – most notably, the need for companies to get enough data about these transactions to reduce fraud from mobile ecommerce. Alcohol/tobacco and direct response were the industries with the most companies that realized more than 50% of their revenue from the mobile channel, with 50% of each industry hitting this milestone. On the flip side, food/drug merchants reported earning the least amount of revenue from the mobile channel, with 52.9% of companies getting less than 5% of revenue from mobile purchases. Mass merchants were most in the dark about how much revenue they realized through mobile purchases, with 40% of companies responding that they do not know the amount of revenue they derive from mobile.